When two former members of Los Angeles’ most nefarious rival gangs decided to unite under one oven, they had no idea that they would be creating an empire. 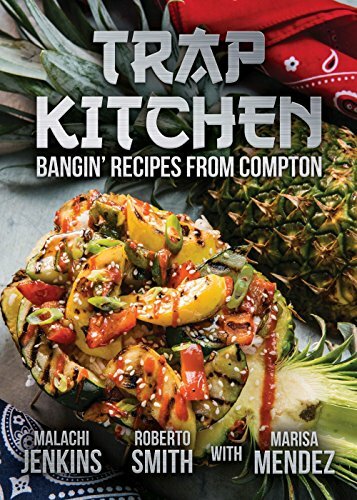 Trap Kitchen is more than just a cookbook. It’s a glimpse into the meals that have now become famous in the LA streets thanks to the series of pop-up restaurants that continue to bloom throughout the area. Celebrities and residents alike flock to the locations for soulful meals, but it’s more than that. Having lost friends and family to violence, we learn how the masterminds behind Trap Kitchen sought to change the paths they were on, using cooking as their driving force. While other cookbooks may boast a level of urban-skewed appeal in their realness, this cookbook also delves into the stories of why they became involved in cooking in the first place. It’s both a heartfelt and stomach-filling experience to learn how two men changed their stars by seeking out peace and good food for themselves and their community. Malachi Jenkins and Roberto Smith are childhood friends from neighboring rival gangs, brought together by their two passions: food and girls. Today they are the co-founders and owners of Trap Kitchen LA. The underground culinary experience was completely fueled off Instagram. Their colorful past has made them media darlings, having appeared on the Today Show, Martha & Snoop’s Potluck Dinner Party, VICE, The Huffington Post, Fox 11 News, and BET. Marisa Mendez is a media personality and journalist who has built her reputation around all things digital, working for some of the biggest names in entertainment and hip-hop. The New Jersey native is most recognized for her work as the co-host of Joe Budden’s I’ll Name This Podcast Later, at Hot 97 on Ebro In The Morning, and as a writer on Funkmaster Flex’s blog, In Flex We Trust. After leaving Joe’s podcast, Marisa launched her own, Marisa Explains It All, which hit number one on iTunes’ Music Podcasts chart after just two episodes. In addition to her career on the mic, she is also a digital strategist, and has managed social media campaigns for Pusha T’s clothing line Play Cloths, French Montana, Swizz Beatz, Nicki Minaj and more.